Name Variation Jean Marie Moore was also known as Jeane. Name Variation Jean Marie Moore was also known as Gean. Married Name 21 October 1944 As of 21 October 1944,her married name was Kuhle. Married Name after 1980 As of after 1980,her married name was Anfinson. Jean Marie Moore was born on 1 March 1920 at Dubuque, Dubuque, Iowa. She was the daughter of William S. Moore and Mary Amy Rupp. Jean Marie Moore married Oliver J. Kuhle on 21 October 1944 at Rolla, Phelps, Missouri. Jean Marie Moore married William Anfinson after 1980. Jean Marie Moore died on 10 July 1991 at Dubuque, Iowa, at age 71. 1 January 1925 Dubuque Precinct 11, Dubuque, Iowa Jean Marie Moore appeared on the census of 1 January 1925 in the household of William S. Moore at Dubuque Precinct 11, Dubuque, Iowa. [S250] U.S. Federal Census 1930 U.S. Federal Census, by Ancestry.com, Year: 1930; Census Place: Julien, Dubuque, Iowa; Roll: 654; Page: 25A; Enumeration District: 30; Image: 105.0. Married Name 3 May 1940 As of 3 May 1940,her married name was Ostrander. Married Name 3 January 1957 As of 3 January 1957,her married name was Kuennen. Hilda G. Moore was born on 19 December 1922 at Dubuque, Dubuque, Iowa. Hilda G. Moore married Carl J. Ostrander on 3 May 1940 at Dubuque, Iowa. Hilda G. Moore and Carl J. Ostrander were divorced before 1957. Hilda G. Moore married Herbert Kuennen on 3 January 1957. Hilda G. Moore died on 11 January 2011 at age 88 Hilda G. Kuennen, age 88, of Bethany Home, formerly of 1037 White St., passed away at 9:38 p.m. Tuesday, January 11, 2011, at Bethany Home. Services will be held at 11:00 a.m. Saturday at Sacred Heart Catholic Church. Burial will be in Linwood Cemetery. To celebrate Hilda's life, friends may visit from 3:00 to 7:00 p.m. Friday at Behr's Funeral Home, 1491 Main St., where there will be a parish wake service at 3:00 p.m. She was born on December 19, 1922, in Dubuque, daughter of William and Mary (Rupp) Moore. Hilda married Herbert Kuennen on January 3, 1957; he preceded her in death on February 17, 2000. She was a devoted wife, mother and homemaker. Hilda was known as the "Walsh Lady" from her 30 years in the second floor at the Walsh Stores. She was a former member of St. Mary's Catholic Church. Hilda was an avid bowler who was proud of her accomplishments. She enjoyed her flowers and making floral arrangements. Hilda loved feeding the birds and squirrels by hand. She was an accomplished baker and considered it her "therapy." Anyone who has tried her pies or cookies can attest to her baking ability. Survivors: a daughter, Linda (Luis) Moscoso, of Dubuque; two sons, David (Mary) Ostrander, of Dubuque, Michael (Elaine) Ostrander, of Potosi, Wis; a stepdaughter, Nancy (Terry) Nix, of Lancaster, Wis; a daughter-in-law, Pat Ostrander, of Dubuque; a brother, William Moore, of Dubuque; a brother-in-law, Don Gilligan, of Dubuque; 17 grandchildren, 49 great-grandchildren and 9 great-great-grandchildren; She was preceded in death by her parents, her husband, two brothers, and four sisters, one in infancy. A Hilda G. Kuennen Memorial Fund has been established. The family would like to thank the nurses and staff at Bethany Home for their care and concern for Hilda. A special thank-you to Hospice of Dubuque, who made Hilda's last day the most comfortable she has had in quite a while. 1 January 1925 Dubuque Precinct 11, Dubuque, Iowa Hilda G. Moore appeared on the census of 1 January 1925 in the household of William S. Moore at Dubuque Precinct 11, Dubuque, Iowa. Married Name 12 April 1921 As of 12 April 1921,her married name was Rupp. Barbara Catherine Spautz was born on 18 May 1902 at Dubuque, Iowa. 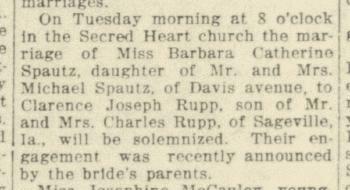 She married Clarence Frank Rupp, son of Charles Rupp and Mary Anne Schiffman, on 12 April 1921 at Dubuque, Iowa, Barbara Catherine Spautz and Clarence Joseph Rupp engagement announcement. Barbara Catherine Spautz died on 6 November 1972 at Dubuque, Iowa, at age 70 Barbara (Spautz) Rupp obituary. [S250] U.S. Federal Census 1930 U.S. Federal Census, by Ancestry.com, Year: 1930; Census Place: Dubuque, Dubuque, Iowa; Page: 7B; Enumeration District: 0009. [S373] U.S. Federal Census 1940 U.S. Federal Census, by Ancestry.com, Year: 1940; Census Place: Sageville, Dubuque, Iowa; Roll: m-t0627-01158; Page: 1A; Enumeration District: 31-13. Lynds Decker Lay was born on 13 August 1868 at Shefford, Quebec, Canada. He was the son of John Brill Lay and Eleanor Savage. Lynds Decker Lay married Mabel Richards, daughter of William B. Richards and Mary Jane Tyack, circa 1894. Lynds Decker Lay died on 3 April 1932 at Jackson, Oregon, at age 63 Spouse: Mabel. Lynds Decker Lay immigrated in 1878 also reported as 1877. [S245] U.S. Federal Census 1900 U.S. Federal Census, by Ancestry.com, Year: 1900; Census Place: Rosedale, Pierce, Washington; Roll: T623_ 1748; Page: 2B; Enumeration District: 147. [S244] U.S. Federal Census 1910 U.S. Federal Census, by Ancestry.com, Year: 1910; Census Place: Hermiston, Umatilla, Oregon; Roll: T624_1289; Page: 7B; Enumeration District: 269; Image: 1096. [S243] U.S. Federal Census 1920 U.S. Federal Census, by Ancestry.com, Year: 1920;Census Place: Hermiston, Umatilla, Oregon; Roll: T625_1504; Page: 4A; Enumeration District: 169; Image: 1116. [S250] U.S. Federal Census 1930 U.S. Federal Census, by Ancestry.com, Year: 1930; Census Place: Belleview, Jackson, Oregon; Roll: 1944; Page: 1B; Enumeration District: 13; Image: 134.0. Philip Lynds Lay was born on 21 September 1895 at Rosedale, Washington. He was the son of Lynds Decker Lay and Mabel Richards. Philip Lynds Lay married Margaret Louise Maxwell circa 1919. Philip Lynds Lay died on 25 October 1969 at age 74. He was buried after 25 October 1969 at Willamette National Cemetery, Happy Valley, Clackamas, Oregon. Philip Lynds Lay obtained US Social Security Card at Oregon; last residence Ashland, Jackson, Oregon. On 5 June 1917 at World War I Draft Registration, Umatilla, Oregon. He lived with Mabel Richards in 1941 at 163 Alida, Ashland, Oregon. In 1942 at U.S. World War II Draft Registration, Ashland, Oregon. John Brill Lay married Eleanor Savage. John Brill Lay was born on 16 May 1834 at Quebec, Canada. He died on 11 June 1872 at Quebec, Canada, at age 38. Married Name Her married name was Lay. Eleanor Savage married John Brill Lay. Eleanor Savage was born on 17 September 1836 at Quebec, Canada. Name Variation Margaret Louise Maxwell was also known as Louise Margaret. Married Name circa 1919 As of circa 1919,her married name was Lay. Margaret Louise Maxwell was born on 21 July 1898 at Washington. She married Philip Lynds Lay, son of Lynds Decker Lay and Mabel Richards, circa 1919. Margaret Louise Maxwell died in 1990. Name Variation Roy E. Peterson was also known as Ray E.
Roy E. Peterson was born in March 1899 at South Dakota. He was the son of Axel Henrick Peterson and Gertrude A. (?). Roy E. Peterson married Vera F. Richards, daughter of William F. Richards and Mary F. (? ), on 14 June 1935 at Davison, South Dakota. [S245] U.S. Federal Census 1900 U.S. Federal Census, by Ancestry.com, Year: 1900; Census Place: Mitchell, Davison, South Dakota; Roll: T623_ 1548; Page: 3B; Enumeration District: 112. [S244] U.S. Federal Census 1910 U.S. Federal Census, by Ancestry.com, Year: 1910; Census Place: Mitchell Ward 1, Davison, South Dakota; Roll: T624_1479; Page: 10B; Enumeration District: 136; Image: 464. [S250] U.S. Federal Census 1930 U.S. Federal Census, by Ancestry.com, Year: 1930; Census Place: Mitchell, Davison, South Dakota; Roll: 2221; Page: 11A; Enumeration District: 19; Image: 808.0. Axel Henrick Peterson was born on 15 October 1869 at Moheda Smola, Sweden. He married Gertrude A. (?) circa 1898. Axel Henrick Peterson died on 23 August 1954 at age 84. [S243] U.S. Federal Census 1920 U.S. Federal Census, by Ancestry.com, Year: 1920;Census Place: Mitchell, Davison, South Dakota; Roll: T625_1716; Page: 1B; Enumeration District: 69; Image: 952. Name Variation Gertrude A. (?) was also known as Gertie (?). Married Name circa 1898 As of circa 1898,her married name was Peterson. Gertrude A. (?) was born on 10 October 1877 at Sweden. She married Axel Henrick Peterson circa 1898. Gertrude A. (?) died on 8 April 1956 at age 78. Gertrude A. (?) had 1 with 1 living in 1900 children. She had 6 with 4 living in 1910 children. Evelyn Peterson was born circa 1912 at South Dakota. She was the daughter of Axel Henrick Peterson and Gertrude A. (?). Donald Peterson was born circa 1915 at South Dakota. John E. Peterson was born circa 1902 at South Dakota. Floyd Peterson was born circa 1906 at South Dakota. Raymond H. Peterson was born circa February 1909 at South Dakota. Charles Coomans was born circa 1843 at Belgium. He married Mary Augusta Davis before 1866. Charles Coomans died before 1900. Name Variation Mary Augusta Davis was also known as Augustine Bertin. Name Variation Mary Augusta Davis was also known as Augusta. Married Name before 1866 As of before 1866,her married name was Coomans. Married Name before 1925 As of before 1925,her married name was Bertrand. Mary Augusta Davis was born on 22 May 1847 at France. She married Charles Coomans before 1866. Mary Augusta Davis married Frank Bertrand before 1925. Mary Augusta Davis died in 1931. 1925 Scottsville, Mitchell, Kansas She appeared on the census of 1925 in the household of Frank Bertrand at Scottsville, Mitchell, Kansas. Mary Augusta Davis immigrated in 1870. She had 8 with 8 living in 1900 children. [S245] U.S. Federal Census 1900 U.S. Federal Census, by Ancestry.com, Year: 1900; Census Place: Lulu, Mitchell, Kansas; Roll: T623_491; Page: 6A; Enumeration District: 85. Nona Coomans was born in April 1882 at Kansas. Charles Caesar Coomans was born on 7 October 1867 at Belgium also reported as Oct 1866; also reported as France. Charles Caesar Coomans married Kittie A. Ellis circa 1893. Charles Caesar Coomans died on 17 February 1956 at San Bernardino, California, at age 88. 1 March 1895 Leota, Norton, Kansas Charles Caesar Coomans appeared on the census of 1 March 1895 at Leota, Norton, Kansas. Charles Caesar Coomans immigrated in 1873. [S245] U.S. Federal Census 1900 U.S. Federal Census, by Ancestry.com, Year: 1900; Census Place: Whitewood, Lawrence, South Dakota; Roll: T623_ 1551; Page: 10A; Enumeration District: 20. Name Variation Kittie A. Ellis was also known as Kitty. Married Name circa 1893 As of circa 1893,her married name was Coomans. Kittie A. Ellis was born in March 1872 at Iowa. She married Charles Caesar Coomans, son of Charles Coomans and Mary Augusta Davis, circa 1893. Kittie A. Ellis died in 1944. 1 March 1895 Leota, Norton, Kansas Kittie A. Ellis appeared on the census of 1 March 1895 in the household of Charles Caesar Coomans at Leota, Norton, Kansas. Kittie A. Ellis had 3 with 3 living in 1900 children. Harry Coomans was born in September 1893 at Kansas. He was the son of Charles Caesar Coomans and Kittie A. Ellis. 1 March 1895 Leota, Norton, Kansas Harry Coomans appeared on the census of 1 March 1895 in the household of Charles Caesar Coomans at Leota, Norton, Kansas. Pearl Coomans was born in April 1897 at South Dakota. She was the daughter of Charles Caesar Coomans and Kittie A. Ellis. Name Variation Claude Le Roy Coomans was also known as Claud. Claude Le Roy Coomans was born in April 1898 at South Dakota. Harold E. Halmrast was born on 10 August 1901 at Wisconsin. He married Mahala Margaret Wilson, daughter of William A. Wilson and Lillie K. (? ), circa 1923. Harold E. Halmrast and Mahala Margaret Wilson were divorced before May 1945. Harold E. Halmrast died on 15 August 1976 at Mendocino, California, at age 75. [S250] U.S. Federal Census 1930 U.S. Federal Census, by Ancestry.com, Year: 1930; Census Place: San Antonio, Los Angeles, California; Roll: 172; Page: 19A; Enumeration District: 1376; Image: 789.0. Married Name Her married name was Brendel. Peggy Ann Halmrast was born on 10 September 1928 at Los Angeles, California. She was the daughter of Harold E. Halmrast and Mahala Margaret Wilson. Peggy Ann Halmrast died on 16 November 1997 at San Luis Obispo, California, at age 69. Minnie Lockey was born circa 1857 at Canada. She was the daughter of James M. Lockey and Jane (?). 1 May 1875 Lynd, Lyon, Minnesota Minnie Lockey appeared on the census of 1 May 1875 in the household of James M. Lockey at Lynd, Lyon, Minnesota. Minnie Lockey immigrated with James M. Lockey and Jane (?) circa 1872 at Canada to, Lyon, Minnesota. James Walker was born on 2 December 1887 at Wisconsin also reported as 02 Dec 1888. He married Anna S. Schalk, daughter of Frank Schalk and Madgdalene Mary Stuer, circa 1931. James Walker died in December 1962. [S373] U.S. Federal Census 1940 U.S. Federal Census, by Ancestry.com, Year: 1940; Census Place: Potosi, Grant, Wisconsin; Roll: T627_4481; Page: 9B; Enumeration District: 22-46. Name Variation William Henry Schroeder was also known as Schraeder. Name Variation William Henry Schroeder was also known as Schrader. William Henry Schroeder was born on 17 January 1906 at Potosi, Grant, Wisconsin. He was the son of Joseph J. Schraeder and Maria Caroline Schalk. William Henry Schroeder died in November 1973 at at hospital, Madison, Dane, Wisconsin, at age 67 William H Schroeder, 68, obituary. 1 January 1925 Dubuque, Dubuque, Iowa William Henry Schroeder appeared on the census of 1 January 1925 in the household of Joseph J. Schraeder at Dubuque, Dubuque, Iowa. [S243] U.S. Federal Census 1920 U.S. Federal Census, by Ancestry.com, Year: 1920;Census Place: Dubuque Ward 1, Dubuque, Iowa; Roll: T625_488; Page: 7B; Enumeration District: 123; Image: 44. Married Name Her married name was Kohler. Name Variation Alvina C. Schroeder was also known as Violet. Married Name Her married name was Koehler. Name Variation Alvina C. Schroeder was also known as Schraeder. Name Variation Alvina C. Schroeder was also known as Schrader. Name Variation Alvina C. Schroeder was also known as Vi. Alvina C. Schroeder married Joseph Kohler. Alvina C. Schroeder was born circa 1912 at Iowa. She was the daughter of Joseph J. Schraeder and Maria Caroline Schalk. Alvina C. Schroeder died after 1973. 1 January 1925 Dubuque, Dubuque, Iowa Alvina C. Schroeder appeared on the census of 1 January 1925 in the household of Joseph J. Schraeder at Dubuque, Dubuque, Iowa.